The Messenger of Allaah (peace and blessings of Allaah be upon him) said: “Trials will continue to befall the believing man and woman, with regard to themselves, their children and their wealth, until they meet Allaah with no sin on them.”And what is more beautiful than coming before Allaah with all our sins extinguished? Is this life not but a taste and a short term home? Or would we rather live in short luxury for an eternal suffering? If cleansing of all of our sins is not enough then what is? May Allaah grant us husnil khaatim (a good ending), Aameen. but give glad tidings to As-Sabirin (the patient ones, etc.). then HE will suffice him. Verily, Allaah will accomplish his purpose. except what Allaah has ordained for us. He is our Maula (Lord, Helper and Protector)." nor for that which had befallen you. All of the above Ayahs order Muslims to wholly and exclusively to rely on Allah (swt) in their lives. It is only Allah who controls the Universe and both good and bad are His decree. The significant element that should always be kept in mind is the omnipotence of Allah (swt). Therefore our actions and the material resources available to us do not guarantee the outcome of any of our undertakings. For example our material and physical strength may deceive us into believing that victory in a battlefield is inevitable. The truth is that our strength or weakness has no bearing on the outcome of the battle, and it is only by the will of Allah that we become victorious or get defeated by the enemy. It was this firm belief that lead a handful of Muslims during and after the time of the Prophet (saw) to fight so valiantly against a formidable enemy over and over again. One may ask, why then do we strive to accomplish any task if we cannot influence its outcome? The answer is rather simple. The actions that we take fall into three categories: They are either obligated upon us by Allah (swt), recommended by Him or we are simply allowed to do them. The obligatory actions are taken because Allah (swt) has ordered them as compulsory. The recommended actions are taken to be rewarded in addition to the rewards we get upon accomplishing the fard. In both of these cases we seek to please Allah (swt), Actions falling under the third category are taken to achieve certain objectives we anticipate to fulfil. However, the certainty of accomplishing those objectives is not under our control. Therefore the cause of initiating any action is not whether we control its outcome. It is the anticipated goal we aim to achieve. This Hadith does not indicate any prerequisite for trusting Allah (swt). It does not, therefore suggest that somehow there is a link between people tying the camel (an action) and putting ones trust in Allah (swt). However, the Hadith conveys an important lesson to all of us: That while trust in Allah (swt) is absolute being independent of what we do it is our responsibility to act on what we intended to accomplish. In this case tying the camel was a right thing to do if the person feared that the camel would run away. Therefore he should have taken the precaution regardless of his trust in Allah (swt). Tying the camel does not take away from his trust in Allah (swt), irrespective of our efforts and the circumstances surrounding us. This belief should help us to this life according to the commands of Allah (swt) even if we face hardships in doing so. Disappointment, hopelessness should not daunt us because we have put our trust in Allah (swt), our Creator and the only Sustainer. Many Muslims indulge in the prohibited actions arguing that it is the only alternative; otherwise they would face disastrous consequences. Avid example is giving riba when buying a house on a mortgage. They regard owning a house as a necessity and we are willing to sacrifice Islam in doing so. They fail to realise that it is only Allah (swt) who provides security for them and their off springs and they need only to put their absolute trust in Him. Unfortunately the materialistic thought that we have acquired from the Kuffar who depend on material gains for their very survival, has drastically influenced our view towards this life as well… we take pride in our wealth and what we do, and have displaced the trust in Allah (swt) by relying solely on material possessions. May Allah (swt) restore only trust in Him for only then can we truly succeed! What does it mean to be patient through trials and hardships? What it means to be patient through hardships is to accept the decree of Allah and not to question it saying: "Why me"? to Allah. We should accept that Allah has inflicted this hardship on us in order to test us so that he may differentiate the strong and firm believer to the weak. By being patient it also means that we should not complain to others about our hardships trials and misfortunes but we should remain steadfast and thank Allah and ask him to make us patient and fim. We should put all of our trust in Allah and know that he is doing what is best for us. We should know that these afflictions will disolve our sins like salt dissolves in water and it maybe that on the day of judgement a person who was tested so much that he may little or no sins left. We should ask of Allah to remove our burden as long as it is better for us but those with the firmest of beliefs want to be tested more so that they may gain closeness to Allah because it is trials and hardships which bring a believer closest to Allah. It is trials and hardships which cause a person to be the best of the believers and gain the highest ranks of Jannah. It is trials and beliefs which make a person a strong firm believer. So when we experience trials and hardships then Allah is wanting us to be patient and persevere and turn towards him in prayer. As well as the 5 daily Salaah we should turn towards him in the latter portions of the night at Tahajjud time for this is a time when Allah showers his mercy the most. We should beg and cry to him and ask of him for forgiveness and also thank him abundantly. 1. One is he who asks of Allah when affliction hits him but when the affliction is over then it is as though Allah never helped him and he hows ungrattitude to Allah. 2. The second is he who when calamity strikes him he breaks down and becomes indifferent to Allah and his commands as if he is owed a comfortale life. The story of Yaqub (As) or Job (As) is a perfect example of the purpose of tests. He was such a firm and strong believer that shaythan asked Allah to test him that is faith may weaken but even after Yaqub (As) lost everything from wealth, health, wife and family he was even stronger in faith and belief. Sameway we are tested to see if we will become stronger believers and closer to Allah or whether we will lose our imaan and become closer to shaythan and our nafs (desires). The best people are those who are tested the most and come out of their tests stronger in faith. Those who were tested the most were the Prophets because they were the best of people. So if a trial and hardship comes our way then we should see it as a blessing in disguise and should remain patient and steadfast and put our full trust, hopes and reliance in Allah and know that victory will be ours in the end. So we need to view this life as a test ground and tests and calamitys as ways of Allah the main examiner testing us to see how well we will be able to do in this test. We should realise that we are only going to be tested for a very short while compared to the eternal rewards that await us as after death we can enjoy the fruits of our patience FOREVER! Know that whatever you have gone through in your past is gone and will never come back: So everyday is a new and fresh day. Yesterday is a distance memory and today is what matters. Therefore live for today and live for each new and fresh day and do not think about yesterday as it is gone and do not think too much about tomorrow for it may never come. Know that each second is a true blessing and every second that ticks by can never again be regained so why should we waste our precious time being sad when our sadness will not change anything and will not benefit us in anyway but that which will benefit us in this world and the next is our good deeds. So Think to yourself: "Why am i wasting my precious seconds being down when i will NEVER get back these seconds again. So there is NO time to for me to be down for my time is so little and it may end at any second". Whatever will happen will happen so there is no point being down when our sadness will not affect the outcome od our destiny. So think to yourself: "Why am i wasting this precious time being upset when everything is pre-destined so whatever will happen will happen so there is NO point me being down about it". Surely death wakes us up into the true reality of our life that we are living to die. Each second that goes by is closer to our death. So why should we be sad when we know our purpose in this life and so we should do EVERYTHING to fulfill that purpose and that means not waste a second on that which will not benefit us in this life or the next. Therefore there is NO point being sad and when we are sad then we should remind ourselves of death and that we will end up in the grave with nothing but our deeds so we should do everything to please Allah and prepare for our daths for sadness will just waste our time and hold us back from fulfilling the very purpose of our life and making the best of the life we have. Think about the time when the sun will be SO close to the Earth. When When you will stand with every creation in the universe and be ready to face Allah with your deeds. This will encourage you to get up and snap out of your sadness and realise that you have to prepare for that day when you will face Allah just you and your deeds! So what point is there being sad? Will it help us when we face Allah on the day of judgement? NO but doing good deeds will! When you are sad then just look at those who have less than you. Look at what you have been given in comparison to them. You have food on a plate 3 times a day whereas they struggle to get a crumb of flour. You drink out of purified tap water when they drink from dirty contaminated water full of disease. Others do not even have a drop to drink for several days. You have shelter and heated homes whereas they live in a tent and refuge camp. They have nothing to keep them sheltered whereas you have four walls with a roof. You have wealth that you can buy all the luxuries in the world whereas they can only dream of what you have. So look at those with less and those who have nothing. Then know how lucky you are so should you really be sad? Instead thank Allah and spend in his path that he may give you more in this world and the hereafter. You could have been born in any era and in any faith or religion. You could have been of those who were misguided. You could have been of those who were not favoured by Allah but you have been given the most special gift of ALL imaan! Therefore appreciate it and thank Allah for it night and day. Why would you be sad when you have been favoured out of countless others? Whenever you are down then make dua to Allah. Turn to him in the latter part of the night when he will attend to you quicker. Turn to him when others are deep in their sleep. Turn to him in humility, meekness and humbleness. Turn to him knowing that he is listening. Turn to him knowing he is the closest to you. Turn to him knowing he cares and he truly loves you. Cry to him and beg of him to forgive you. Ask of him to fulfill your needs but at the same time trust in him that he will do what is best for you. If he wants you to be patient then be patient for you will get SO MUCH BETTER IN RETURN! Turn to him knowing he WILL answer your prayer, if not now, then tomorrow. If not tomorrow then in the hereafter and that is when we will be rewarded most for our dua's and we would wish that NO dua was accepted so that we recieved EVERY reward for our dua in the hereafter. If we make pleasing Allah the source of our pleasure in this life then HOW can we ever be sad? When we live each day to have a highflying career we will never be fully satisfied no matter where our career is because we always want to have a better career. When we live for money then we will never be satisfied because we always want more and will always try new ventures and ways in order to get more and more. When we live for other people then they will always let us down in one way or another. But if we live to please Allah and do good deeds that will make us feel closer to him then what better pleasure is there in life. So when you are feeling sad then think: "Let me get up and do good in order to please Allah for that is my source of true happiness in this life"
So make EVERYDAY a day when you will want to please Allah more than yesterday. When you are sad then turn to Allah and make him the source of your true happiness. Make the pleasure of pleasing him the means of you NEVER becoming sad again. Most of all rely on Allah. Know that he is there for you and closer to you than your jugular vein. Know that he knows you better than you know yourself. Know that he loves you more than any soul ever could. Know that he is there for you when others arent. Know that he will never let you down when others will. Know that whatever you go through in life. So put your FULL trust, faith and reliance in him and know that is is ALWAYS there so trust in him. Masha'Allaah,great reading. I must ask did you write that? He says: 'What did My slave say?" "Inna Lillahi wa inna ilayhi Raji'un"
Allah, may He be glorified and exalted, says: 'Build a house for My slave in Paradise and call it the house of praise.'" - but that Allah will reward him for his affliction and compensate him with something better." She said: When Abu Salamah died, I said: Who is better than Abu Salamah, the companion of the Messenger of Allah? Then Allah caused me to say it and I said it. She said: Then I married the Messenger of Allah (peace and blessings be upon him). Subhanallah Allah truly does give a person better in return! island. He prayed feverishly for God to rescue him. Every day he scanned the horizon for help, but none seemed forthcoming. hut in flames, the smoke rolling up to the sky. weary man of his rescuers. "We saw your smoke signal," they replied. It's easy to get discouraged sometimes when things appear to be going badly. Prophet Ayoub (Alaihi-salam – May be peace and blessings of Allah be upon him) was one of Allah’s very sincere worshippers. We find in his story many lessons that we can reflect upon to assess our relationship with Allah. This story especially should make us question whether all our sincerity and worship for Allah is dependent on His blessings on us. The following story was documented by Ibn Kathir. "Truly! We found him patient. How excellent a slave! Verily, he was ever oft-returning in repentance to Us" (Saad 38:44). Ibn Kathir narrates that once Iblis (satan) heard an angel praising Ayoub (A) to other angels, extolling his noble character, patience and remembrance of Allah and describing him as “the best creature on earth today, and an excellent model for the worshippers of Allah.” The angel also added that Allah had blessed him with long life and plenty of riches, yet he was never haughty or selfish. His family, servants, the needy and the poor, all had a share in his good fortune. He bought slaves to set them free and made those who received his charity feel as if they were doing him a favor. Overhearing all this, Iblis became annoyed and planned to tempt Ayoub (A) and lead him to disbelief. First, he tried to distract him from his prayers by whispering to him about the good things in life, but as a true believer, Ayoub would not let evil thoughts tempt him. Iblis, then tried to attribute ulterior motives to his constant glorification of Allah, projecting his worship as being motivated from greed to safeguard his wealth. Iblis thus said to Allah, "If You deprive him of his wealth You will find that he will no longer mention Your name and his praying will stop." Allah told Iblis that Ayoub (A) was one of His most sincere devotees whose worship stemmed from his heart and had nothing to do with material gifts or favors granted to him. To prove His devotee’s depth of sincerity and patience, Allah allowed Iblis to do whatever he wished with Ayoub (A)’s wealth. Steadfast in his faith, Ayoub (A) replied: "What Allah has taken away from me belongs to Him. I was only its trustee for a while. He gives to whom He wills and withholds from whom He wills,” and he prostrated before his Lord. "I have stripped Ayoub (A) of all his possessions, but he still remains grateful to You. However, he is only hiding his disappointment, for he places great store by his many children. The real test of a parent is through his children. You will then see how Ayoub (A) will reject You." Allah again granted Iblis authority, but warned him that it would reduce neither Ayoub (A)’s faith in his Lord nor his patience. "The circumstances under which your children died were sad. Surely, your Lord is not rewarding you properly for all your prayers." "Allah sometimes gives and sometimes takes. He is sometimes pleased and sometimes displeased with our deeds. Whether a thing is beneficial or harmful to me, I will remain firm in my belief and remain thankful to my Creator." "O my Lord, Ayoub (A)’s wealth is gone and his children are dead, but he is still healthy in body, and as long as he enjoys good health he will continue to worship You in the hope of regaining his wealth and producing more children. Grant me authority over his body so that I may weaken it. He will surely stop worshipping You and will thus become disobedient." "I give you authority over his body but not over his soul, intellect, or heart, for in these places reside the knowledge of Me and My religion." Armed with this new authority, Iblis afflicted Ayoub (A)’s body with disease, reducing it to mere skin and bone. He suffered severe pain yet remained strong in faith, and patiently bore all the suffering without complaints. Hopeful of Allah’s Mercy, he neither despaired nor turned to others for help. Although he had lost all his children and was deprived of his wealth and physically afflicted, he still continued to glorify Allah the Almighty day and night. His disease lasted for a long time. His friends felt disgusted and his close relatives deserted him. The sole companion and comforter through many years of his suffering was his kind and loving wife. "How is it that your cleverness cannot work against Ayoub (A), yet you succeeded in misleading Adam, the father of man, out of paradise?" Iblis went to Ayoub (A)’s wife in the form of a man. "Where is your husband?" he asked her. "How long are you going to bear this torture from our Lord? Are we to remain without wealth, children or friends forever? Why don’t you call upon Allah to remove this suffering?" She replied, "For eighty years." Then he asked, "How long have I been suffering like this?" Then he told her: "In that case I am ashamed to call on my Lord to remove the hardship, for I have not suffered longer than the years of good health and plenty that I enjoyed. Your faith seems to have weakened and you are dissatisfied with the fate decreed by Allah. If I ever regain health, I swear I will punish you with a hundred strokes! From this day, I shall not eat or drink anything from your hand. Leave me alone and let my Lord do with me as He pleases." "And (remember) Ayyub (Job), when he cried to his Lord: ‘Verily, distress has seized me, and You are the Most Merciful of all those who show mercy.’ So We answered his call, and We removed the distress that was on him, and We restored his family to him (that he had lost) and the like thereof along with them as a mercy from Ourselves and a Reminder for all those who worship Us” (Al-Anbiya 21:83-84). 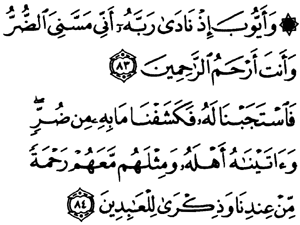 "And remember Our slave Ayyub (Job), when he invoked his Lord (saying): ‘Verily Shaitan (Satan) has touched me with distress (by ruining my health) and torment (by ruining my wealth)!’ (Allah said to him): "Strike the ground with your foot: This is (a spring of) water to wash in, and a cool and (refreshing) drink." 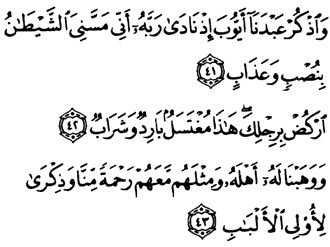 And We gave him (back) his family, and along with them the like thereof, as a Mercy from Us, and a Reminder for those who understand (Sad 38:41-43). Ayoub (A) obeyed Allah’s instructions, and almost immediately his good health was restored. Meanwhile, his faithful wife who could no longer bear to be parted from her husband returned to beg his forgiveness, and to serve him. On entering the house, she was amazed at the sudden change she saw. Ayoub (A) had regained his health! She embraced him and thanked Allah for His mercy. "And take in your hand a bundle of thin grass and strike therewith (your wife), and break not your oath" (Sad 38:44). Thus Allah the Most Merciful rewards His faithful and grateful servants. This story should remind us that we should never make our worship and sincerity toward Allah contingent on our perceived blessings. Allah tests us in many ways and we should, therefore, be steadfast in His worship constantly. remains) hard and straight till Allah cuts it down when He wills." Therefore let us realise that Almighty Allah knows everything that what we are going through and the pain and anguish that we are feeling but he is quite for a while in order to see how we will react. Will we be patient and remain patient for his pleasure and get closer to him or will we become restless and impatient and go further away from him. Know that Allah is with those who are patient though they may not know it. Therefore we must fully trust and rely on him and know that after much patience will certainly come victory for this is the promise of Allah and Allah ALWAYS keeps his promises!